Techniques to Introduce Rats to Rats — Means – What, Exactly? Can I just say, my heart goes thumpity-thump when I help rats learn to love each other? Photo to the right: Pemy, black berkie, who has lost her sister, Dicey, goes on a shoulder ride with Tookie and Gulliver during several weeks of an introduction process. Gloves are just gloves! At the heart of what matters is how the rats relate to each other while the human wears the gloves, and, most critically, the human is responsible for how the rats relate to each other. Connect with your own heart, and let’s follow the heart of the method. The Heart of Behavior Modification of Pet Rats. First, if the rats are leery or afraid of the gloves, help the rats acclimate to them. Gloves for introductions are “ho-hum” neutral to the rats. Use your gloved hands, with or without the length of one or both arms laid out between the rats such that the rats keep some distance from each other. Use your arm or gloved hand to gently divert the rats from each other if they begin to approach too close. What is “too close”? If you identify even small body language signs of stress, aggression, or fear, the rats have come too close to each other. With the proper distance, the rats stay calm and relaxed throughout the session. Use body language signs to determine that the distance is right. Keep sessions short – just a few minutes long. The rats watch each other watching each other as they move around and explore their environment. Bathtub, Carrier, Glove, Shirt, or Pouch: These Are Just Things and Not Techniques. Over time, gradually allow the rats to come a tiny bit closer to each other. The rats remain relaxed each time. How much time? Use the body language of the rats to answer this. For some rats, they might brush against each other in the same session and remain calm. For other rats, they may need to stay 2 feet apart for several days before they’re allowed to move to 8 inches apart for 3 more days. Lots and lots of repetitions over many days, or weeks, for as long as it takes, with incremental new many baby steps. If one rat lunges to bite the other – which we work to prevent at all costs, but still might accidentally happen – wearing gloves provides the best safety option for both rats and humans. What Is Important About Progressing the Rats? There is no strict formula to “Do X, then Y, then Z”. The behavioral science is to pair the two rats so that they remain calm and relaxed. Watch the rats’ body language to guage whether any activity would be good for these particular rats at this particular time. End on a good note; If everything seems to be going excellently, you have lots of calm contact between the two rats, so that you decide to allow more contact, and then – OOPS – one rat tenses up, or crouches down, or gets poofy, this compromises the good work that you have done. Stay alert! Just because the rats were great during one baby step, does not mean they will retain or maintain their nice behaviors in the next baby step. for your own peace of mind and safety for the rats, imagine you are starting completely over every time you add a new bit of stress, a new situation, or a new context. The list of examples below shows how baby steps might progress. 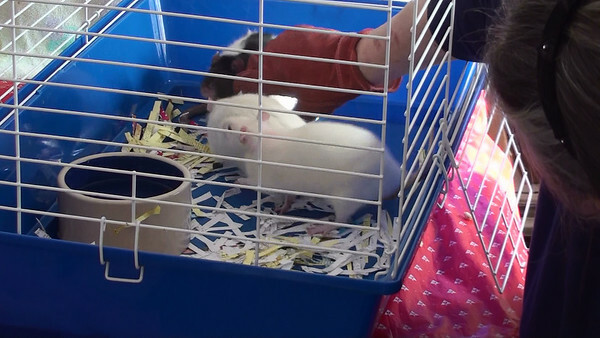 The METHOD is to pair the 2 rats in a variety of settings so that they are calm and relaxed with each other. This list is very particular – it’s for rats who like to be handled by you and who enjoy being with you. An entirely different set of activities would be needed for rats who are unsocialized or fearful of humans. Any examples I give you are just a few of the hundreds you might try. If the rats are now calm when they meet on the neutral table, allow a few seconds of sniffing, but before tension can arise, gently divert them away from each other. Repeat many times. If the rats are now calm when they meet on the neutral table, bring them to a stop next to each other and stroke them together for a few seconds. This assumes both rats already enjoy being stroked by you. Release and divert them away from each other. Goal: the two rats relax next to each other briefly. Repeat many times. If both rats separately enjoy being brought into your arms, bring one of the rats onto your arms, and then the other, so that the rats lay side by side. Stroke them briefly and then release them away from each other. Repeat many times. If riding on your shoulder or in your arms (at chest level) is fun to both rats, bring the two rats onto your arms, walk 5 feet away, stroke them as you walk, and then return to the table and release them away from each other. Repeat many times. The body language you want to see is the rats focused on “out there” and “wow, walking is fun!”, and not on each other. Extend the length of your walk with the two rats in your arms. Repeat many times. Allow one of the rats to move up to your shoulder for the walk. Continue holding the other rat. Repeat many times. Allow one rat to occupy each of your shoulders. Rest a hand on each rat so that you can assure they stay there. Walk 10 feet. Return to the table, bring them both down onto your arms, and release them away from each other. Rats love pouches; however, two rats who have not yet been fully introduced may become territorial. Any enclosed or even semi-enclosed thing – hammock, pouch, small box, large box, space pod, litter box, small cage, medium cage, or large cage, for example – is territory a rat owns. In this context, allow one of the rats into the pouch. Let the other rat sniff the opening. Switch rats. In this example the 2 rats are not allowed into the pouch together. 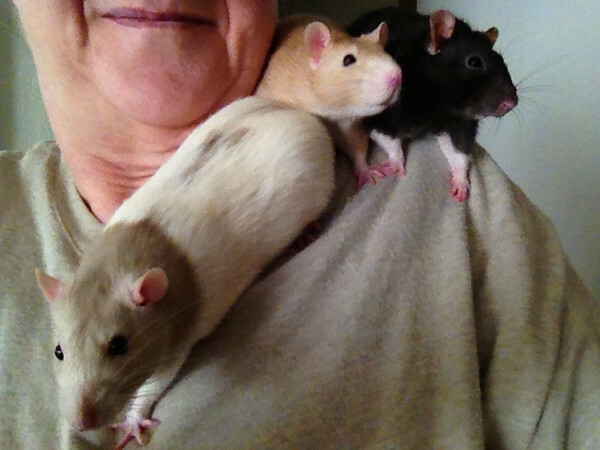 Have the two rats in your arms or on your shoulders as you go for a walk. Bring the pouch opening to them and allow them both inside. As they enter, slide your gloved hand into the pouch between them. Set the pouch down on the table, stroke the 2 rats for a moment, and then gently maneuver one rat out, and then the other. Introduce a large open “box bottom”, for example 14 inches by 24 inches, with sides only 2 inches high. I’ll stop here, but as you can imagine the fun can go on and on, and in the end you have rats who are just living together peacefully, just like Pemy and her new buds Gulliver and Tookie. Woo hoo! Be alert to insure that neither of the rats becomes scared, worried, or aggressive. Piloerection (“Poofy”) should not happen. No rat remotely has an opportunity to hurt another. If you do use gloves and inadvertently one or more rats does react aggressively, this defeats the purpose of a good introduction, but at least the gloves provide the best option for safety until you can get back on track. I hope this information proves useful. Watching two rats learn to love each other is a wonderful experience!